Laura Racioppi was born and raised in East Islip, NY and graduated from St. John the Baptist High School. She attended Hofstra University where she studied Business Administration with an emphasis in Human Resources. Laura later went on to work for a private transportation company, overseeing the Department of Social Services contract for handicapped pre-school children in all of Nassau County for ten years. Laura is currently employed at Suffolk Federal Credit Union in Medford, NY, a not-for-profit cooperative financial institution, as an Assistant Vice President and Executive Assistant to the President/CEO. She has been with the credit union for the past 12 years, starting out in the Human Resources Department and moving on into Administration. 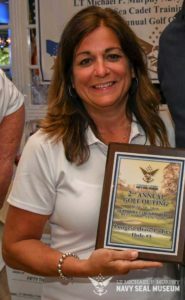 Laura also served as the former Treasurer of the Holiday Beach Property Owners Association, a community of 507 homes located in Center Moriches, N.Y. for 7 years, along with Treasurer of the Masury Estate Ballroom Fund. The ballroom, which is listed on the National Register of Historic Places, is owned and operated by the Holiday Beach Property Owners Association in Center Moriches, NY where she currently resides.